© 2015 by Chen Qiufan. 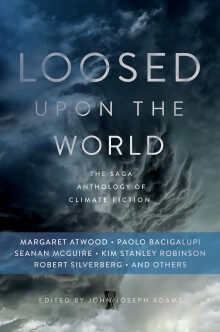 Translated by Ken Liu and Carmen Yiling Yan. | Art © 2015 by Elizabeth Leggett. 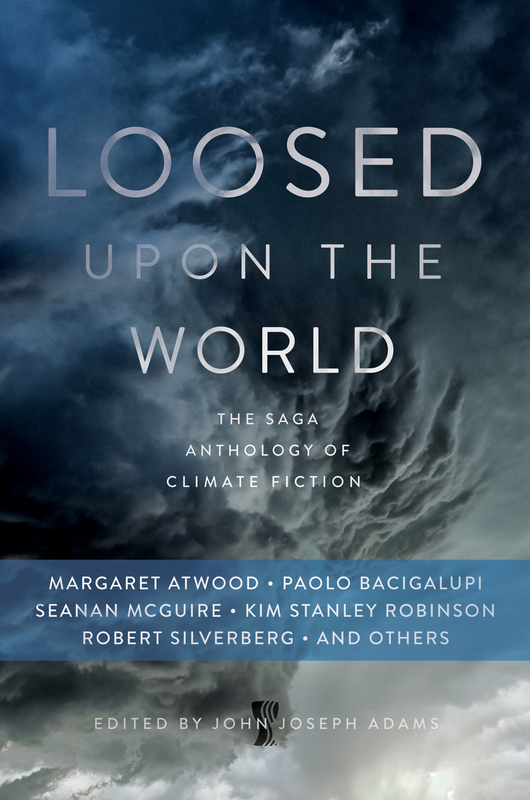 This story also appears in the climate fiction anthology LOOSED UPON THE WORLD edited by John Joseph Adams. Available now from Saga Press. Lao Sun lived on the seventeenth floor facing the open street, nothing between him and the sky. If he woke in the morning to darkness, it was the smog’s doing for sure. Through the murky air outside the window, he had to squint to see the tall buildings silhouetted against the yellow-gray background like a sandy-colored relief print. The cars on the road all had their highbeams on and their horns blaring, crammed one against the other at the intersection into one big mess. You couldn’t tell where heaven and earth met, and you couldn’t tell apart the people either. Passels of pedestrians, dusty-faced under filter masks that made them look like pig-faced monstrosities, walked past the jammed cars. Lao Sun washed, dressed, and got his kit. Before he left, he made sure to give the picture frame on the table a wipe. Lao Sun smiled, put on his mask, and stepped out of the elevator. On his light electric bike, he nimbly wove through the gaps between the crawling traffic. There were plenty of children banging on car windows hawking newspapers and periodicals, but no cleaners. This smog was here to stay for another couple of weeks. No point in cleaning cars now. Through the goggles on his mask, he could just barely see the road for a couple dozen meters ahead. It was as if someone was standing above the city pouring dust down endlessly. The sky was darker than the ground, dirty and sticky. Even with the filter mask, you felt as if the smog could worm its way through everything, through dozens of layers of polymer nanomaterial filter membrane and into your nostrils, your pores, your alveoli, your blood vessels, and swim all over your body from there; stuff your chest full until you couldn’t breathe; and turn your brain into a drum of concrete too thick to stir or spin. People were like parasites burrowed into the smog. On these occasions, Lao Sun always thought of old times with his wife. Lao Sun parked his bike at the roadside and entered the big fancy skyscraper with all the fancily dressed men and women going in and out. They were all wearing filter masks, saving them the trouble of greeting him. The building manager was polite to him, though. He told him one of the public elevators was broken, so the others were crowded. He should use the freight elevator in the back, although it meant climbing a few more floors. Lao Sun smiled and said it was fine, although the manager couldn’t see that, of course. He took the freight elevator to the twenty-eighth floor, then climbed the stairs to the open platform on the top floor. It made him pant and puff a little, but no matter. From the top of the skyscraper, he could better see the smog: The aerosolized particles that engulfed the city hung thick like protoplasm, motionless. Lao Sun began to unpack his bag, taking out and assembling each intricate scientific instrument. He wasn’t clear on how they worked, but he knew how to use them to record temperature, pressure, humidity, visibility, particulate matter density, and so on. The devices were spruced-up versions of civilian-use models, less precise but much more portable. He glanced northwest. He should have been seeing grand palaces and shining white pagodas, but today there was only the same murk as everywhere else. He remembered how it looked in the fall, the red leaves dyeing the hillsides layer by layer, trimming the clear blue sky. The white towers and the falling leaves all reflected in the lake’s emerald surface: a tranquil airiness through which the cooing of pigeons drifted. On that day, the two of them had sat in a boat at the center of the lake, rowing slow circles. The oars drew ripples that washed aside the fallen leaves. Golden sunlight spilled on the water, glittering. She was covered in golden light, too. At the designated time, Lao Sun recorded the data, and then started packing up. He knew that at that moment there were more than a hundred individuals like him in each and every corner of this city doing the same thing. They belonged to a civilian environmental organization, officially registered as the “Municipal Smog Research and Prevention Society,” unofficially known by the catchier moniker of “The Smog Society.” Their logo was a yellow window with a sponge wiping through the accumulated grime, leaving behind a patch of cerulean blue. The Smog Society wasn’t as radical as some green groups, but it wasn’t the government’s cheering squad either. Its official status was unclear, its work low-key, its membership slowly and steadily growing. They sometimes appeared in the media, but only quietly and cautiously. All groups had their own worldview and style, but not all viewpoints were acceptable. The Smog Society only espoused what was acceptable: Aside from the biological dangers, smog also caused psychological harm — easily overlooked, but with far greater and longer-lasting consequences. Lao Sun hurried to the next sampling location. On his way, he saw some people with bare faces — manual laborers unable to afford masks. Their skin was much dimmer and grayer than the sky, suffused with an inky gleam like coarse sandpaper. They were constructing a completely enclosed skywalk to connect the whole of the central economic district together seamlessly so people wouldn’t have to go outside. Lao Sun knew that antioxidant facial films were all the rage right now. Many women would apply a thirty-nanometer-thick layer of imported facial spray before putting on their masks. It blocked UV radiation and toxins, and would naturally shed with the skin. Of course, not everyone had a face precious enough. If the facial spray had appeared a few years earlier, he would have bought it for his wife for sure. Just a few years earlier. He shook his head. It felt as if his old wife was once again sitting behind him. He stopped the bike. This was a large stock exchange center, where every day a mix of young and old and of every color congregated to stare at the huge LCD screens suspended in mid-air, their expressions shifting with the rise and fall of graphs and numbers. It was a giant gambling den, where everyone thought themselves a winner, or a soon-to-be winner. As usual, Lao Sun climbed onto the roof and began his measurements. 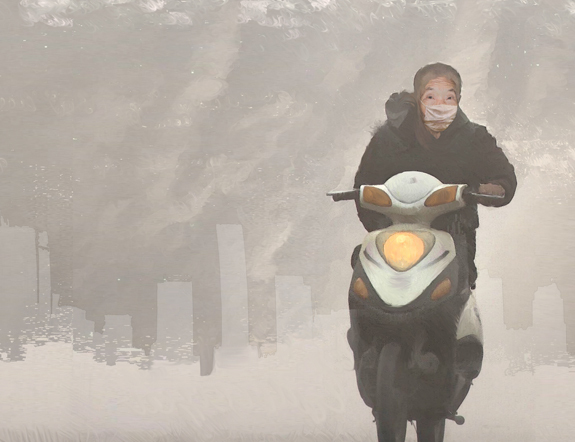 Lao Sun vaguely knew some of the Smog Society’s philosophy, but not well. Maybe his rank wasn’t high enough. He’d joined the Smog Society for simple reasons — giving some purpose to his monotonous post-retirement life. Of course, by the time you lived to his age, you tended to understand that having a purpose in life wasn’t any more important than living itself. One afternoon, he’d been dragged to some so-called psychological counseling course, located on the tenth floor of a rundown building where the elevator doors squeaked. He wasn’t interested, but he’d caved under his old coworker’s pleading and gone with him. At first he’d thought it was some Buddhist or Daoist lecturer spouting philosophy to con people into giving him money, but he discovered otherwise. He first filled out a quiz that indicated that his depression level scored 73 out of 100. Out of all the attendees, he counted as below average. The speaker smoothly drew his audience in. Some began to sob and wail, some threw chairs, others hugged each other tightly and revealed their most deeply hidden little secrets. Lao Sun had never seen anything like it. He didn’t know what to do. Someone patted his shoulder: a lady of about thirty, who could be considered beautiful, though not beautiful enough to move someone Lao Sun’s age. She introduced herself as the administrator of the Municipal Smog Research and Prevention Society. He didn’t remember her name. He’d wanted to say no, but he glanced at the flyer and a few words caught his eye. He accepted it. Lao Sun wanted to ask more, but she’d hurried away already. A specter flashed in front of his eyes at that moment: his wife. He looked at the flyer again. Smog Causes an Increase in City Residents’ Depression Rates. The current consensus holds smog to be the product of industrial pollution combined with natural weather patterns. Automobile exhaust, industrial waste gas, and other forms of man-made particulate matter are caught in thermal inversions where the temperature of the air decreases with altitude, cold on top and hot on the bottom. An inversion layer forms 100 meters from the surface and closes over the ground like the lid of a pot. With no wind, pollutants in the city disperse too slowly and become concentrated near the surface. Combined with lack of precipitation, strong sunlight, and low humidity, the conditions promote photochemical reactions between pollutants to form smog. As of now, there are no methods of prevention. For Lao Sun, aside from bronchitis, acute emphysema, asthma, pharyngitis, strokes, and the other physical ailments, the most immediate consequence of smog was the sense of removal from the world. Whether you were dealing with people or things, you felt as though you were separated by a layer of frosted glass. No matter how hard you tried, you couldn’t really see or touch. That the masks meant to protect from smog added a second layer was especially ironic. The detachment, the numbness, the estrangement, and the apathy now all had an obvious physical excuse for existing. The city was cocooned. The people were cocooned. As Lao Sun rode his bike, the highway overpasses wound overhead like giant dragons, alternating light and shadow. They widened the roads every year, but the traffic still grew more and more congested. Even so, all these people remained willing to squeeze themselves into their little cars, watch the endless lines crawl forward inch by inch. They hid in their four- or five-square-meter metal cans and kept a safe distance from the world and other people. And so the air pollution worsened, too. At last he reached his final destination, a daycare called Sunflower. Sunflower Daycare was built on a raised railway platform and looked like a giant glass greenhouse with children studying and playing on each floor. They didn’t need masks; the parents had to foot the bill for the expensive air circulation systems, but even so, looking at those healthy, rosy, bare faces crying or laughing, it seemed worth it. At least they were still genuine. At least they still had hope. Each time, Lao Sun would hungrily gaze at the children behind the glass, losing track of time. As he looked at these exposed souls romping and frolicking, another voice would sound, so close it seemed right next to him, so far it seemed decades in the past. Lao Sun tasted salt in the corner of his mouth. Something had trickled down his face and between his lips. Strange how the present seemed so blurry, when he could see and hear everything from his memories so clearly. Sometimes they’d play over and over in his mind. No wonder they said old people got nostalgic. That conversation was decades old. When you’re young, money is important, a house is important, a car is important — everything is important — and yet you still end up neglecting the most important things of all. By the time you earn all your money and get all the things you ought to have, some things are lost forever. Lao Sun understood now, but he was already old. And so far, no one had invented a time machine, or a pill to take away regret. Xiao Wang had joined the society half a year earlier than Lao Sun. He had a job during the day and spent his free time with the society. They were from the same hometown, so they ended up close to each other. 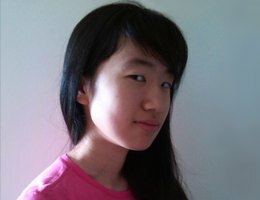 Xiao Wang began to lay out the deeper theory. The Smog Society’s monitoring had three components. Lao Sun participated in the basic weather monitoring. In addition, at each sampling location, the psychological states of the relevant people were monitored. The exact method was unclear: maybe with miniature RFID chip sampling, maybe with the entrance security systems or networks, maybe using free goodies with questionnaires attached. Of course, the easiest and most accurate way was to pay the target population to download software that displayed survey questions to be answered at specific times. Either way, they managed. More secretly, they conducted laboratory experiments, researching aerosol distribution in the atmosphere, the electrosensitivity of organic hydrocarbons, bioelectric fields, physical manifestations of psychological conditions under different environmental circumstances, and other similar topics. A tenet of statistics is using large quantities of long-term data to eliminate sampling biases and other sources of error. All of this effort had one goal: creating a mathematical model of smog to examine the connection between aerosol systems and human psychological states, controlling for weather conditions. They discovered that the bioelectrical fields generated by groups displayed coherence: the overlay of peaks and valleys caused the bioelectric field within a certain area to approach constancy. It was like the folk wisdom that fair and foul moods were both infectious. And these large-scale bioelectric fields, in turn, affected the distribution of aerosolized particles. Generally, the lower the psychological health score, the greater the density of particulate matter, and the more stable their formation — in other words, the thicker the smog, and the slower it dispersed. They also found that within the PM distribution system were bands of greater density like ocean currents, mostly located along thoroughfares with severely congested traffic, flowing sluggishly, dissipating once the traffic eased to congregate in nearby areas with high population density. The sampling locations in the central economic district and high-density residential areas showed PM densities significantly higher than the average in other sampling locations. These areas had the lowest psychological health scores as well. In contrast, areas with dense populations of teenagers and children had higher psychological health scores, and the air quality tended to be better. And at large stock exchanges, the psychological health score, the air quality rating, and the stock prices were all closely correlated. Causation also went the other way: the smog lowered people’s psychological health scores. Therefore, barring major changes in weather, marauding cold fronts, or an increase in wind, the smog would continue to strengthen its grip. Lao Sun said goodbye to Xiao Wang and returned home. There were still leftovers in the refrigerator, ready to heat and eat. Ready to heat and eat. In that moment, he felt like he’d returned to that hot, humid night. The two of them lay side by side, unable to sleep. The next day, when Lao Sun woke, his wife had already left. He took out the meal from the fridge, heated it, and ate. The laundry from the night before still hung on the balcony. The sky was still gray. Lao Sun suddenly panicked, like he’d never panicked before. He hadn’t panicked like this back then when he first saw her. He remembered how he’d dug through his heart to find things to say, back then, while she replied so carelessly. He’d felt as frantic as an ant on a hot pot. Then they were going out, and there was no end to the back-and-forth. Then they married. Each attending to their own career, they’d had less time together, and less to say. They said a bit more only when they fought. His career alternately rose and fell, and she missed her best childbearing years. She started to nag; he started to hold his tongue. They fought, and they threatened divorce, but in the end neither of them could leave the other. One nagging, the other silent, they’d passed so many years. It seemed that both of them had gotten used to it. If you weren’t meant to love each other, you wouldn’t be together, Lao Sun had thought. It wouldn’t be a half bad life, to be like this till the end. But almost at the finish line, she left. Lao Sun felt like his heart emptied in that moment, deflated to nothing, like a burst balloon. A week later, the Smog Society disbanded. Some people from the government invited Lao Sun to have tea and “talk” but allowed him to leave afterwards. Several of the organization leaders had disappeared, and the core members had also been “called in to talk.” When they returned, they said nothing. When they met smog buddies, they looked at them like strangers. Rumors spread after that. Some said that the smog above the city was actually an enemy country’s new climate-altering weapon, while others said it was a side effect of their own country’s new secret weapon tests gone wrong. There was an even bolder theory claiming that the smog was really a massive gaseous life form. It — or maybe they — lumbered over the city, subsisting on industrial waste gas and the nitric acid, sulfuric acid, and hydrocarbon particles from automobile exhaust. They were slowly dissolving the calcium in human bones. In time, people would become afflicted with osteoporosis and rickets. Children and the elderly would easily break bones, even become paralyzed. Of course, the rumors were quickly debunked. After investigation, the calcium-sucking monster story was tracked back to a calcium supplement manufacturer. Its unscrupulous marketing practices were punished as they deserved. The government vowed to formulate a five-year plan to return blue skies to the people. As for that report, it was as if it never existed. Today was smoggy again. Lao Sun got up early as usual, washed, dressed, and got his travel things. Before he left, he made sure to give the picture frame on the table a wipe. The woman in the frame smiled at him. That photo was more than ten years old by now. He smiled at the elevator girl. The elevator girl saw the mask he carried and smiled back. Lao Sun put on his mask and got on his light electric bike. It was festooned with lights and streamers of every color and played chipper music. All along his journey, passers-by in pig-snouted masks watched him, pointed at him. His bike was like a Brazilian parrot zipping through a desert, brilliant, colorful, and noisy. He went straight to Sunflower Daycare, got off the bike, and stood in front of the massive glasshouse. Lao Sun opened his bag and scooped out his strange little knick-knacks. First he filled some helium balloons and let them float high. The children stopped their games and ran to the window to watch this man in the clown mask. The music continued to play from the bike’s speakers. He followed the rhythm, slowly and comically contorting his body, and began to juggle. Lao Sun was breathing heavily. Something had trickled down his face and into his mouth, salty. The little pixies were wide-eyed, their faces pressed against the window, pink and white. They were laughing, showing their teeth, some of them clutching their bellies, even. The caretakers were laughing too. An old song played from the speakers. Rowing the boats as the warm wind blows . . .
And laughter flies ’round the clouds in circles . . . The melody, which was so cheerful that it verged on the absurd, pierced the glass. The children began to move to the music, following the clown in his gymnastics. They laughed unabashedly, singing, dancing, crowing, every bare face shining golden. Lao Sun looked up at the sky. The smog seemed to be thinning too.